They all seem to be on the make with their noses in the trough. Frankly, I can see this ending with the mayor and his cronies in jail. Ordinary Portuguese people are really struggling just now, and the thought Manuel da Luz and co ripping off so much money won't be going down well. China would just shoot the whole lot of them for corruption, to keep the furious locals happy. I wonder if Amoral is still chummy with the Mayor? They were certainly as thick as thieves, if you'll pardon the expression, when the €€€€€€€€€s were flying freely. The Mayor even gets mentioned in Gonzo's 'book' - he thanks Dr. Manuel da Luz. :«After dinner, just outside of the restaurant, there was a huge cake, dessert and champagne. The Mayor of Portimão, Manuel da Luz, and a few members of his staff joined the party. At 11.30, there was fireworks, "Happy Birthday" was sung and champagne bottles were popped. Clearly, The Curse of Gonzo has struck again! Oh, Hizzoner was at Gonzo's book launch, too! Yes, and don't forget to send in a bill of €1,000,000 to the EU for turning down the noise on the fountain! Call it 'urgent repairs to a historic artefact', something like that, they'll never catch on! My my! Another one bites the dust! socratesThe Attorney General's Office confirmed the arrest of former prime minister of Portugal, José Sócrates, at Lisbon airport on Friday 21 November. The Office also confirmed that a total of four arrests have now been made, including the arrest of the former prime minister, as part of an investigation by the Central Department of Investigation and Penal Action into tax fraud, money laundering and corruption. The other detainees are Carlos Santos Silva, businessman and friend of Socrates, Gonçalo Ferreira, a lawyer who does work for a company owned by Carlos Santos Silva and Joaquim de Castro a representative in Portugal for the drugs company Octapharma which Socrates has worked for since 2013 as a ‘consultant’ for Latin America. Why do Morais and her ilk NEVER tell readers the truth about the endemic corruption in Portugal, and instead entertain themselves making up sh*te about the UK? Or do we already know the answer to that? Ho Ho. You couldn't make it up. They are all at it. I bet we don't hear much about this from Morais, Citizen Churnalist. I know that none of us are surprised? The former prime minister José Sócrates was on Friday arrested in connection with a process that investigates tax fraud crimes , according to a note from the Attorney General's Office issued tonight . The former prime minister has been arrested on suspicion of corruption and tax evasion . Tax evasion? Just like Gonzo, then? I bet we don't hear much about this from Morais, Citizen Churnalist. he DN knows that the former government disputes the veracity of the facts that support the news that has been published by the newspaper because " had no share in the government to do directly with changes to laws in the National Health Service " the Mail Morning report having been authorized by you , and that " unaware that these changes , according to the news hampered the multinational said "
Another coincidence? A NHS link? It's the Portuguese Health Service, moron! Instead of inventing ridiculous, if hilarious, conspiracy theories, why don't they link it to the HUGE corruption scandal that's erupted a few miles down the coast in Portugal? You know, Portimao under da Luz, with Gonzo swaggering around as his enforcer, must have been a lot like Chicago under Capone. Lovely Sofa must be feeling the pinch now the Money Fountain has been turned off, too, with her working for City Hall - when she could be bothered turning up. Anyone think Morais is going to be reporting on these Portuguese Family Values? Police violates daughter inside the post Agent PSP enjoyed the days when it was the only one to serve in his squad and abused there, at least five times, less than 14 years. By John Tavares It was seen as an agent of exemplary authority and was already subject to internal processes in PSP. But the shock came when it was learned that the police 41, to serve on an island in the Azores Central Group, sexually abused his own daughter, 14. On at least five occasions, made ​​him even within the PSP station where he worked. Was now held by the Azores Judicial Police. Set in a framework of alcoholism - both the mother and the father were known for excessive drinking - the under 14 began to be harassed by his father earlier this year. And in recent months, the PSP officer passed from words to deeds. Taking advantage of the absence of women, the police began sexually abusing her daughter inside the house where the family lives - requiring you later, under threat, not to tell anyone anything. The acts succeeded is a very frequent basis. Then the police decided to abuse the lowest in the very place of work. The serve a small community, the squadron of PSP in question is sometimes just a service agent. And it was in this scenario that the man took her daughter to the police station and away from the gaze of colleagues, sexually abused minor. He did it at least five times, and the competent authorities to try to understand the extent of the crimes. Recently, the less ended up counting the abuse of another family member who referred the case also in school the victim attends. The lowest was then heard by a psychologist, who denounced the whole scenario to the authorities. The PJ eventually gather evidence and proceeded to arrest the police the night before last, inside the house. Will await trial in custody. Am shocked. I thought that Portugal and its territories was the only crime free paradise on earth. Socrates: "I feel freer than ever" Ex-prime minister is remanded in custody in the Evora Prison. José Socrates, who is in custody in Evora, made ​​a brief statement to the weekly Expresso . In a telephone conversation, the former prime minister says he feels "freer than ever" and adds that "only ceases to be free who loses dignity." The former deputy Duarte Lima was on Friday sentenced to 10 years in prison in legal matters worse, in the case Homeland related to credit obtained in Portuguese Business Bank (BPN) to purchase land in Oeiras. Lima Duarte: "This is a decision with profound mistakes" Duarte Lima was charged with fraud, money laundering and breach of trust and, in closing arguments, the prosecutor (MP) asked the collective of judges, chaired by Filipa Valentine a sentence of more than five years in prison. The same sentence was requested for Victor Raposo, member of Duarte Lima, accused of fraud. Duarte Lima was sentenced to six years in prison for aggravated fraud and seven years for money laundering, and to fulfill a single sentence of 10 years in legal height. Already Victor Raposo was sentenced to six years of actual imprisonment for aggravated fraud. João Almeida Paiva and was sentenced to four years of actual imprisonment for aggravated fraud and falsification of documents, and his brother Pedro Almeida Paiva and was sentenced to two years and six months in prison for aggravated fraud and falsification of documents, although the punishment can be suspended if you pay 50,000 euros to the Portuguese Institute of Oncology. Francisco Canas, known as the 'Zé medals', was sentenced to four years of actual sentence for money laundering. The prosecutor of the Republic José Nice asked the acquittal of Pedro Lima, son of the former leader of the parliamentary group of the PSD, accused of fraud and money laundering. Only Pedro Lima was acquitted in this process. Duarte Lima says the decision is "brutal, unjust and undeserved" On leaving the court, on the campus of Justice in Lisbon, Lima Duarte maintained that the decision of the group of judges, chaired by Filipa Valentine, contains "deep and glaring factual errors" and also "errors of law" with their defense lawyers will appeal to higher courts. For the main trial accused the "central point" of the process focused on "alleged deception of BPN" on the loan for real estate business related to the purchase of land in Oeiras, but the seven responsible for the former Portuguese Business Bank, ears as witnesses at trial, rejected the idea that they had been misled or that they did not have all the information to decide on the funding. For this reason, the former deputy and lawyer believes that "there was no fraud" and that "what went wrong" was the fault of the real estate crisis and the collapse of the former BPN, chaired by Oliveira Costa. Lima Duarte denied that if "driven victimize" and rejected the argument set out in the judgment, that exercised its "political and social influence" for the financing of the BPN. It all seems very complicated. Here's hoping the ex-Mayor of Portimao and his cronies will be joining them before too long. Oh well, there you go. Too sad. Too bad. What a bugger. How funny! Bennett and the rest of the pathetic, desperate hounders are trying to drag the McCanns into Socrates' downfall - looking in the wrong direction, as usual. Funnily enough, they don't seem to be mentioning the shenanigans in Portimao, the Algarve Film Commission, Lovely Sofa's involvement in all this - none of the frauds and scandals that involve their beloved Gonzo's chums. Haters never could face the truth. Incidentally, the haters are all whining about the cost of the Yard investigation. They do realise that it's just small change in comparison to the VAST sums of money ripped off from the EU, aka us, and Portuguese taxpayers, by the Portimao mafia? You know how the Amoral ostriches are, Bonny. 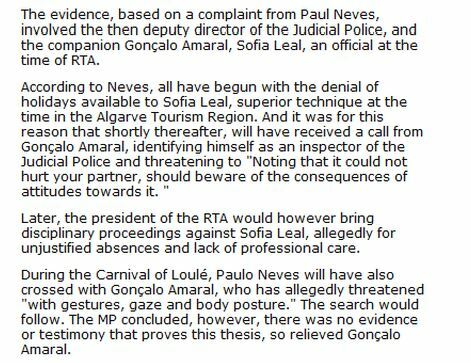 Wonder if this story, from earlier this year, is of significance in the Algarve corruption saga? Witchcraft in Évora chain Service was commissioned by a person close to José Sócrates, ensures the 'wizard' of Barcelos. Master Alves, the 'wizard' of Barcelos, was this Sunday at the door of Prison Évora. Spoke to journalists and then killed a black chicken with the chain. He also left a role, on which was written: "The people who betrayed José Sócrates will suffer the consequences." According to the Master Alves own, this service was ordered by a person close to the former ruler. During Sunday morning, the former prime minister, remanded in custody in the Prison of Évora, received a visit from Dr. Eduardo Barroso and expert in political communication Luís Martins Passion. Can't be many European politicians with supporters that sacrifice chickens outside jails. Bonkers, the lot of them.